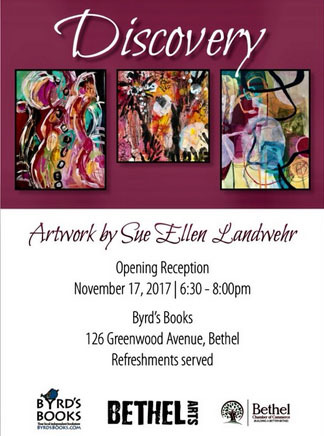 Byrd’s Books welcomes Bethel Arts by opening up some wall space for an art exhibit. For what they hope will be a long-lasting beautiful relationship, they love the idea of mingling art and books. A small wall- but it’s yours! 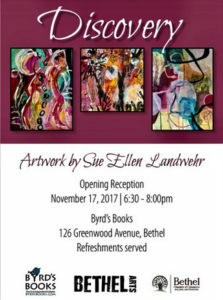 Sue Ellen Landwehr is the artist who is featured on their wall this holiday season. Please join them to celebrate her art and the launch of her work. WHEN: Opening November 17, 2017, 6:30 p.m. to 8:00 p.m.